STL file extension is used in stereolithography CAD software, created by 3D Systems. This file format is supported by many other software packages for rapid prototyping, 3D printing and computer-aided manufacturing. STL format was invented by Albert Consulting Group for 3D Systems in 1987. Since initial release, format remained relatively unchanged for 22 years. In 2009 was proposed STL 2.0 after update to the format. 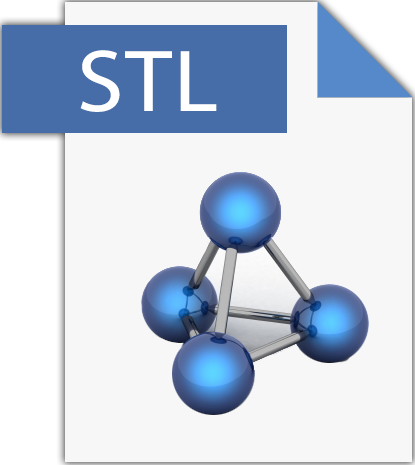 STL file stores information about 3D models and describes only the surface geometry of the 3D object without representation of texture, color or other common model attributes. This format approximates the surface of 3D model using triangles. The process of tilling a flat surface with one or more geometric shapes without overlaps and without gaps is called “Tessellation”. Because of that sometimes STL is also referred as “Standard Triangle Language” or “Standard Tessellation Language”. STL format specifies both, binary and ASCII representation. Because ASCII STL files can be very large, binary version is more common because they are more compact. ASCII STL begins with “solid”, continues with number of triangles, and file ends with “endsolid”. Binary STL contains 80-character long header, 4 bytes integer that indicates number of triangular facets, data describing each triangle, and file ends after last triangle. Most common use of STL files is in 3D printing. 3D printing is process where material is joined or solidified under computer control to create 3D object, with material being added together layer by layer. 3D printers are stereolithography machines that can build any volume shape as series of slices.